It is often assumed that the judiciary—especially the Supreme Court—provides the best protection of our religious freedom. Louis Fisher, however, argues that only on occasion does the Court lead the charge for minority rights. More likely it is seen pulling up the rear. By contrast, Congress frequently acts to protect religious groups by exempting them from general laws on taxation, social security, military service, labor, and countless other statutes. Indeed, legislative action on behalf of religious freedom is an American success story, but one that renowned constitutional authority Fisher argues has been poorly understood by most of us. Taking in the full span of American history, Fisher demonstrates that over the course of two centuries of American government Congress has often been in the forefront of establishing and protecting rights that have been neglected, denied, or unrecognized by the Court-and that statutory provisions far outstrip, in both number and importance, the court cases that have expanded religious rights. In this concise and insightful book, Fisher presents a series of important case studies that explain how Supreme Court rulings on religious liberty have been challenged and countermanded by public pressures, legislation, and independent state action. He tells how religious groups interested in securing the rights of conscientious objectors received satisfaction by taking their cases to Congress, not the courts; how public uproar over a 1940 Supreme Court ruling sustaining compulsory flag-salutes resulted in a court reversal; and how Congress intervened in a 1986 ruling upholding a military prohibition of skullcaps for Jews. 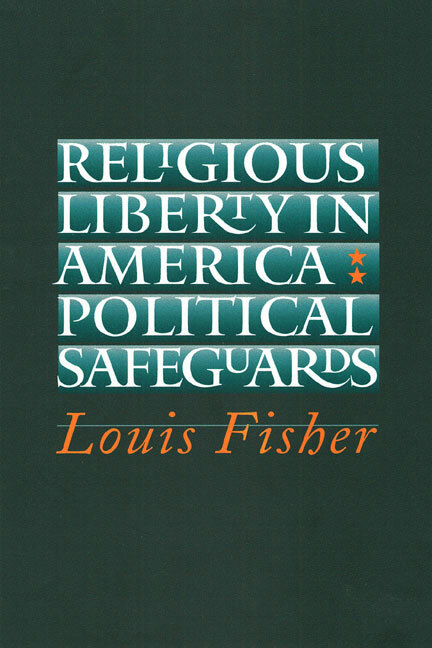 By describing other controversies such as school prayer, Indian religious freedom, the religious use of peyote, and statutory exemptions for religious organizations, Fisher convincingly demonstrates that we must understand the political and not just the judicial context for the safeguards that protect religious minorities. As this book shows, the origin and growth of an individual's right to believe or not believe—and the securing of that right—has occurred almost entirely outside the courtroom. Religious Liberty in America persuasively challenges judicial supremacists on church-state issues and provides a highly readable introduction for all students and citizens concerned with their right to believe as they wish. Louis Fisher is Senior Specialist in Separation of Powers at the Congressional Research Service, Library of Congress. Among his books are Presidential War Power and Constitutional Conflicts Between Congress and the President, both from Kansas.